I have these two Labuan stamps I am trying to research, on the reverse they are stamped Robson Lowe, I understand that in 1934 Colonel GSF Napier sold his North Borneo & Labuan collections to Robson Lowe. I wondered if you can give an opinion on whether these stamps are from that collection, or any other information on them? I have just looked again and at last noticed that the Labuan overprints are on the wrong stamps! The correct ones would be on the State of issue of 1894 whereas these are on the British type of 1889. The Overprints are no good anyway and I think the Robson Lowe chops are an added feature that were put there by the forger to enhance his product. He needed to check the catalogue before he started work. I cannot comment on the Purple fiscal cancellations of the stamps as the reproduction is not, unfortunately, good enough. Some while ago a member of the MSG came over to one of our local meetings with a stamp which had a potential flaw that he wished to check. There was quite a heavy postmark over the location of the potential flaw. 5 minutes with a good microscope soon sorted out that the flaw was present. I have used a microscope to check layering of markings for just such a reason as presented here should identify the authenticity of the overprint. Now that I back home after the Autumn 2009 SSS Annual Meeting I have had a chance to further consider the Labuan $5 and $10, and believe that I can add a bit to the description of the discussion provided by Roger. My 'bit' is based on my having recorded as many copies of these values as was possible from auction catalogues, articles and details of certifications held by the Royal Philatelic Society of London and the British Philatelic Association. 3. The fiscal cancellation - the only fiscal cancellation seen by me on the $5 and $10 is that of THE SEAL OF THE GENERAL COURT OF LABUAN, which does not resemble the cancellation on the illustrated $5 and $10. Is Clive Sellen able to decipher the cancellations? 4. The ROBSON LOWE backstamp - I have never previously seen this on Labuan stamps. Although it is not recorded by www.filatelia.fi/experts it seems to me that there is no reason to suppose that it is not genuine. 5. I have no information as to whether these stamps came from the Napier collection. At the Autumn 2009 SSS Annual Meeting a number of members examined these pictures. 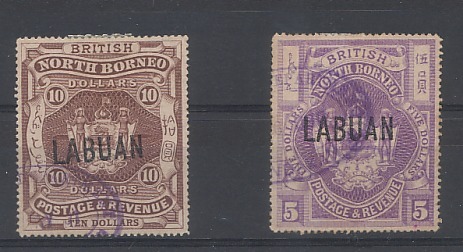 There was general agreement that the stamps were fine although several members had doubts about the “LABUAN” overprint. 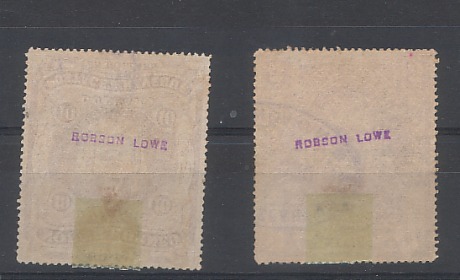 None of the members had seen the “Robson Lowe” chop and it was suggested that it might have been applied to provide a false provenance for a doubtful overprint.